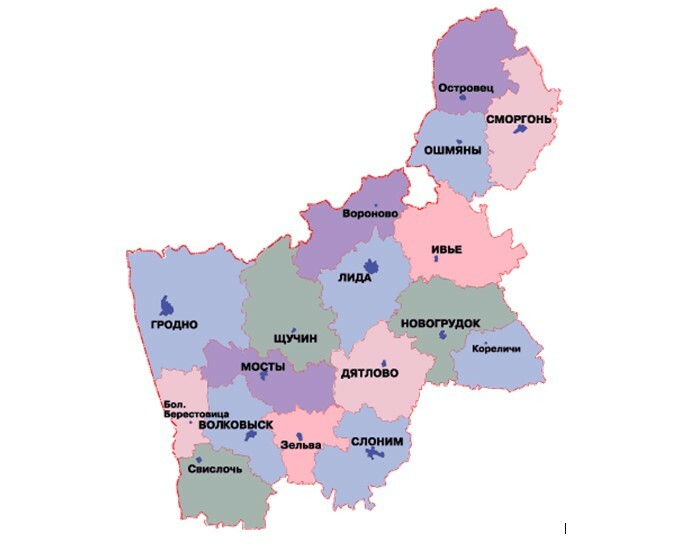 The Grodno region is located in the northwest of Belarus, borders in the west with Poland and in the north with Lithuania. Through territory of the region passes one of important highways of Eurasia, that promotes wide international cooperation. The largest cities are Grodno, Lida, Slonim, Volkovysk, Smorgon, Novogroudok. The last is the centre of origin of the Belarusian statehood here in XII-XIII cc. There was the Great Lithuanian Principality where the Belarusian grounds have come. Grodno is one of the most beautiful Belarusian cities in which many history-architectural monuments were saved: the castle of XIII-XVI cc., the Boris and Gleb church of XII c, the catholic church of Jesuites, the catholic church of Bernardines of XVI-XVIII cc. and many other sights giving constant charm to the city. Cards of the region are restored and updated castles at Novogroudok and Lida, the church-fortress in v. Synkovichy of XV c, the Zhyrovitchy orthodox monastery of XVII - XIX cc. The complex in which there is the wonder-working icon of Zhyrovitchy Mother Divine is one of the most important objects of pilgrimage and tourism not only in the region, but also in the republic.